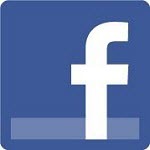 Facebook has released a “happiness index” based on the status updates people make on their site. They have an algorithm that looks for words connected with positive and negative feelings, and categorize the status updates accordingly. Just look at these graphs. 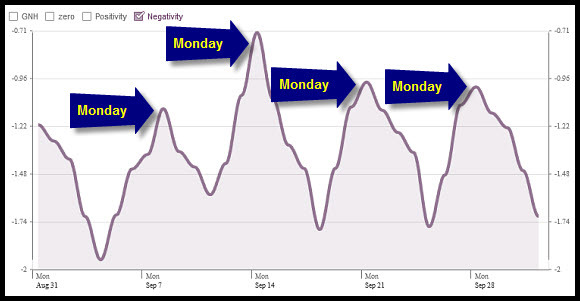 As you can see, the overall level of happiness bottoms out every Monday. The low level of happiness on Mondays isn’t just caused by a lack of positivity. 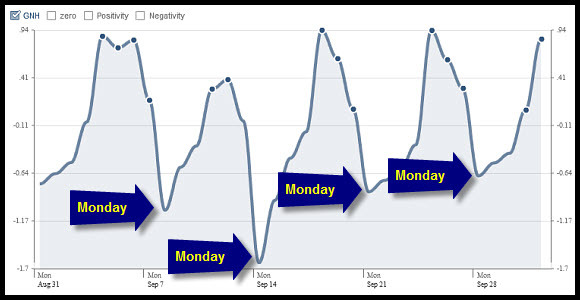 If we look at the negativity alone, it becomes clear that people are in a really negative mood on Mondays. People really do pick themselves up during the weekends, though, and we’re a lot happier on Fridays as well (anticipating the weekend, we presume?). 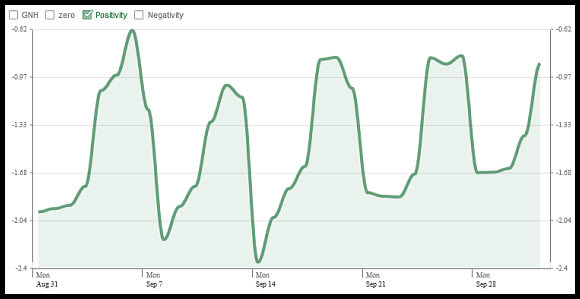 This “happiness index” clearly shows Facebook’s data mining potential. Considering its huge user base and active users, there are tons upon tons of data available, and the question is how Facebook will be using it. We’d love to see more of these “indices”. As long as the data is of a general nature there shouldn’t be any privacy concerns, so we’re all for this kind of information being made available. Data source: All graphs are from Facebook’s United States Gross National Happiness page, with those elegant arrows added by us.